I thought I had a post on here about how much I love lentils. 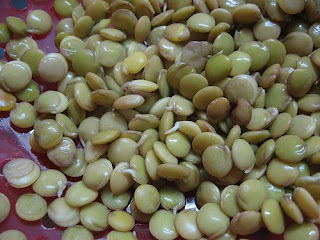 And while I do mention lentils quite often I don’t seem to have a post completely dedicated to these little gems. I did not grow up eating lentils and to be quite honest the first time I made them I wasn’t overly impressed. They fell apart when I cooked them and ending up resembling something like oatmeal instead of a bean. The taste was nothing to write home about either. It wasn’t bad just kind of blah. But I stuck with it and found some recipes that really worked for our family. Now I really enjoy both eating and cooking lentils. And I really enjoy sprouted lentils. I like to make big batches of foods one time and turn them into other meals over the next few days and originally that was how I cooked lentils also. A blog that is no longer available (Lentils and Rice) was where I first read about cooking up a batch of lentils and brown rice (together). Day 1 would be Lentils and Rice with green salad. Day two the lentils and rice would become patties and then day three a soup or maybe a fritatta. I don’t always cook my lentils and rice together. Instead, I soak the lentils on day 1 and use them that night in something like this wonderful Majadareh. Wardeh states that this is an authentic recipe but I’m sure that by the time I make my changes, it is no longer authentic 🙂 We certainly do enjoy it though. My changes are fairly minimal. Since I want to have lentils for not just the one night but for several and as different meals I soak about 5 cups of lentils starting them in the early morning. I also soak the brown rice called for in the recipe but in a separate container (or sometimes if I already have leftover cooked brown rice, I’ll just use that adding it at the end of cooking). The well soaked lentils have plumped up and increased in size. I remove about 6 cups of the soaked and drained lentils to use for my Majadareh. I then proceed with the recipe as listed substituting broth for half of the water. Since I get rid of the soaking water from my lentils I do have to keep an eye on the liquid as everything cooks. Sometimes I need to add more water/broth. Sometimes it works out fine. In the comments section, Wardeh indicates that the authentic way to serve Majadareh is with a green salad (tossed in olive oil, lemon juice, salt and pepper) and plain yogurt serving all three on the same plate. And possibly alongside a roast, meatballs, or salmon. We usually just have the Majadareh, salad and yogurt but sometimes I’ll make these delicious Arabic meatballs also from Wardeh. This makes a very generous amount of Majadareh which means we usually have this for lunch the next day too. When we are having lentils, Day 1 is almost always Majadareh now. I really love this dish! I have left my drained lentils to sprout. What works best for me is to sprout them in the colander that I’ve drained them in. I put a plate under them and a light towel over them and sit them on my counter. 24 hours later they will usually have a small tail on them. At this point I can use them as a lightly sprouted lentil such as Sprouted Lentil Tacos which are spectacular or I just pretend they are soaked lentils and use them as such. During the winter we especially like Garam Masala Lentil Soup with Coconut Milk. I use about 2 cups of the slightly sprouted lentils in this soup along with 1 cup of soaked rice. And I substitute broth or broth/water for the 8 cups of water. Edited to Add: I decided to change my menu around for the week and made the Garam Masala Lentil Soup a day early. As a result, I hadn’t put any brown rice to soak to add to the soup. Instead I used 3 1/2 cups of the lightly sprouted lentils. It was delicious. And very nourishing since I used only chicken broth and coconut milk as the liquids. Plus with using just the sprouted lentils I believe the recipe is GAPS friendly. By this point I usually have well sprouted lentils. And one totally fun thing about lentils is they expand tremendously when sprouted. Truth be told, I often have enough sprouted lentils left for not just one but two meals from my original 5 cups (about 2 pounds). I’ve recently discovered the best Sprouted Lentil Burgers from Cara at Health, Home & Happiness. I actually discovered these when I was subscribing to her menu mailer. In the menu mailer she serves them with a Tahini Dressing. WOW are they good. Other great Sprouted Lentil meals are the tacos previously mentioned, Lentil Slaw, Spicy Sprouted Lentils or a Lentil Salad. I love doing a lentil salad (something like this) or lentil slaw since it can easily be adapted to whatever ingredients we have on hand. With the amount of lentils I have left, I can make a big batch allowing us to enjoy it for a couple of days since this salad seems to improve with age (especially with a vinaigrette style dressing). Of course, there is a chance by that point that we could get a little tired of lentils. That doesn’t usually happen since I’ve created different dishes with different flavors but by making that salad/slaw I can turn it into a side dish instead of the main focus. A slab of meat sitting next to a sprouted lentil salad looks quite nice. Lentils are incredibly frugal. I usually buy them in bulk for around 75 cents a pound. $1.50 for the basis of 3 or 4 meals seems pretty reasonable to me. In addition, the recipes listed/linked above all have very basic ingredients that don’t add terribly to the cost. Do you enjoy lentils? Please share your favorite lentil recipes.